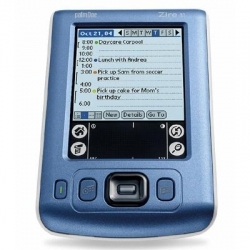 The Zire 31, the successor to Palm's Zire 21, is designed for value-conscious students, parents, and anyone who wants to keep their most important day-to-day schedule and contact information close at hand. The bright color screen lets you show off your favorite snapshots (stored on optional expansion cards) to friends, family, and coworkers. The Zire 31 also offers a built-in MP3 player and Secure Digital card expansion for storing digital audio files and photos. The 16 MB memory (14 MB user available) can store thousands of phone numbers, addresses, lunch dates, meetings, birthdays, doctors' appoinents and shopping lists.